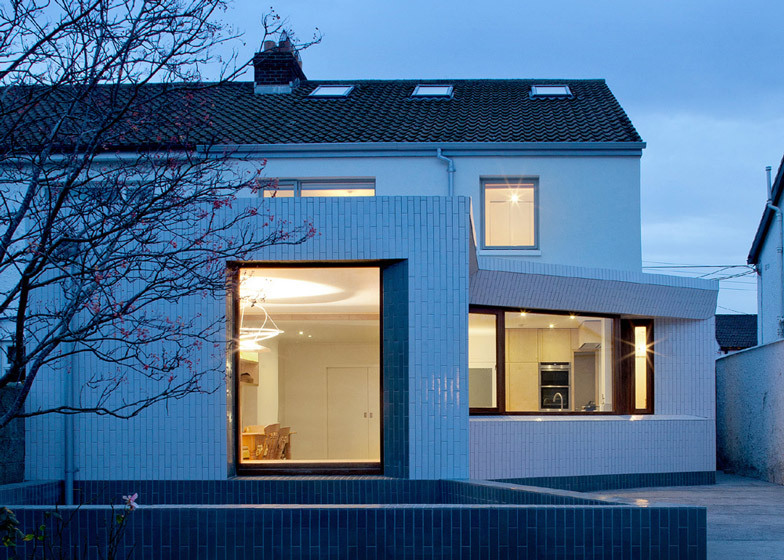 Irish studio GKMP Architects added glazed white tiles to the angular walls of this extension to a semi-detached house in Dublin to help direct sunlight into the interior (+ slideshow). GKMP Architects designed the Greenlea Road extension for the home of a family of five, who wanted a large, bright living area that improves the connection between the house and the garden. "The old layout included a dining room and garage extension to the west of the ground floor, which cut evening light to the interior and enclosed the kitchen within the plan, blocking light and access to the garden," architect Michael Pike told Dezeen. 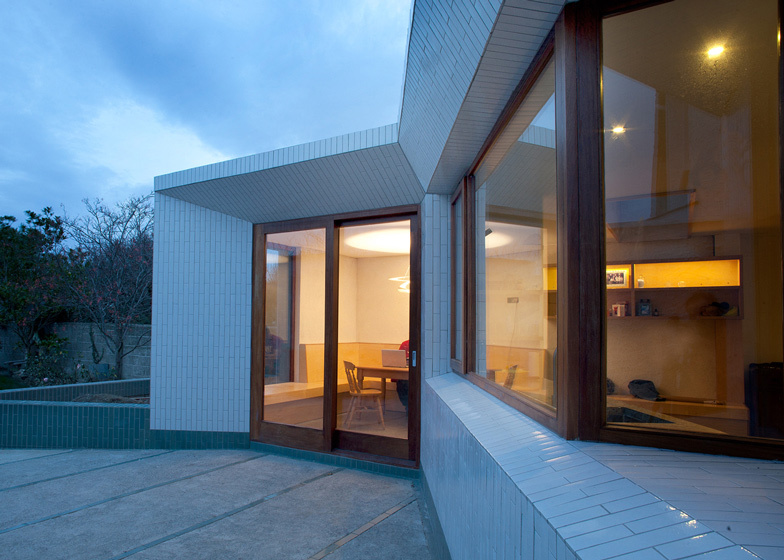 The existing extension built in the 1990s was demolished to make room for the new addition, which contains an open-plan kitchen, dining and living area filled with light from the windows and a central skylight. The shape of the walls and the shiny surfaces of the glazed tiles surrounding the doors and windows help funnel daylight into the extension. "The tiles were used for the texture they bring to a facade and for their ability to bounce light into the interior to brighten the terrace and garden spaces," explained Pike. 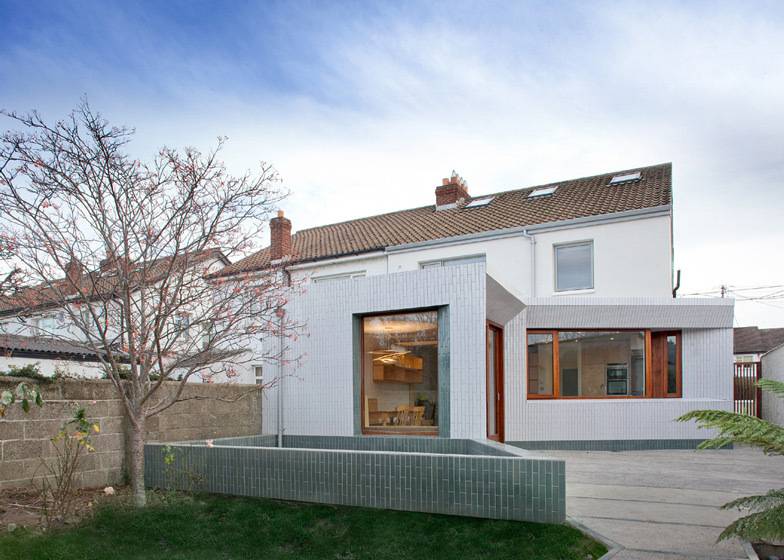 GKMP Architects used terracotta tiles that resemble brickwork to clad another extension in Dublin. Tiles are well-suited for use as a practical and decorative exterior finish said Michael Pike. 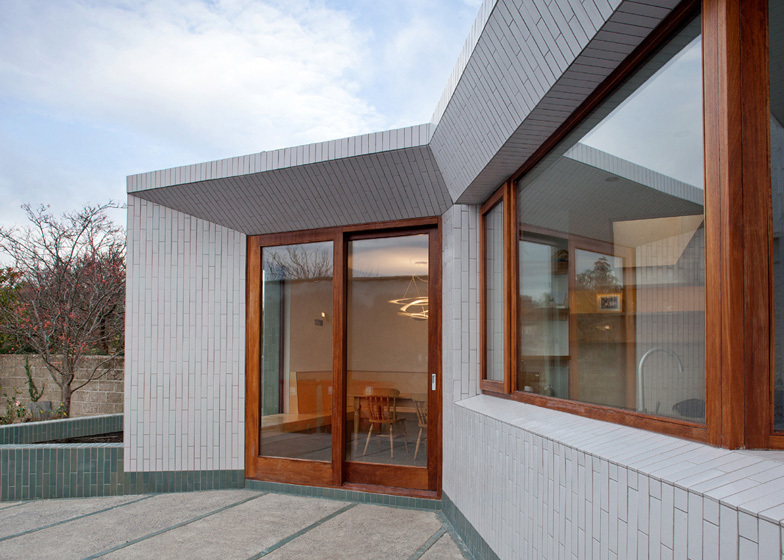 "Ceramic tiles are a very traditional material however they are not widely used externally in Ireland," Pike pointed out. "We use the tiles as a cladding to bring texture and warmth to a facade and also to highlight or draw attention to certain details." Door and window frames made from iroko wood stand out against the white ceramic tiles, but also contrast with green tiles that surround some of the windows and cover a low planter that extends towards the garden. 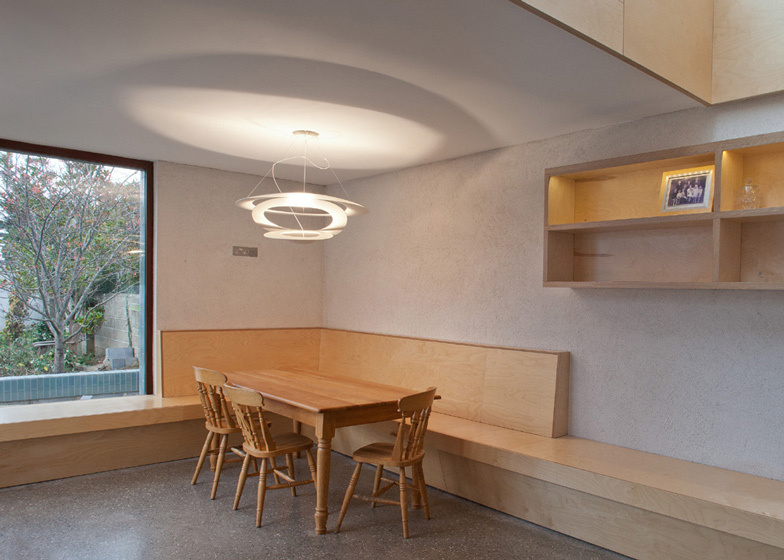 A skylight lined with plywood introduces more light into the interior, while a polished concrete floor used throughout the ground floor helps to reflect it around the space. The kitchen features a cast concrete countertop that complements the floor and contrasts with the natural surfaces of the birch plywood benches and cabinetry. There is also a store room, utility room and shower room that continues around the corner of the house. Photography is by Paul Tierney. This project involves the demolition of a 1990s extension and shed to the rear of a semi-detached suburban house in Dublin, Ireland and the construction of a new single storey extension to the side and rear extending to 31sq.m. 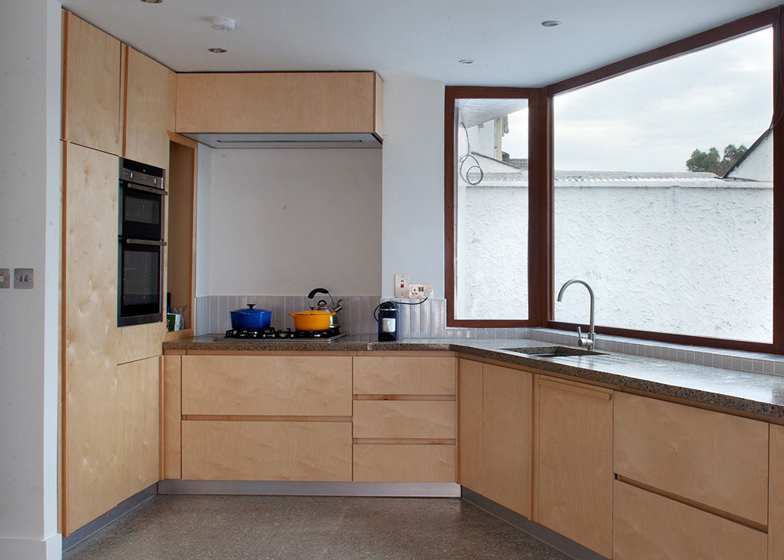 A new plywood kitchen and dining space open out to receive west light and connect to the back garden. White glazed tiles bring texture to the facade and bounce light into the interior and onto the new polished concrete floor, whilst the cast concrete countertop then continues the language of the floor into the new plywood kitchen. New windows are made from Iroko timber and green ceramic tiles are used to highlight certain window openings. The green tile is also used to draw attention and add scale to the washed concrete terrace. A large planter, clad also in green, seeks to bring the garden right up to the dining room window. Inside, a large, plywood-lined skylight marks the transition between old and new construction and serves to bring light into the centre of the living space.